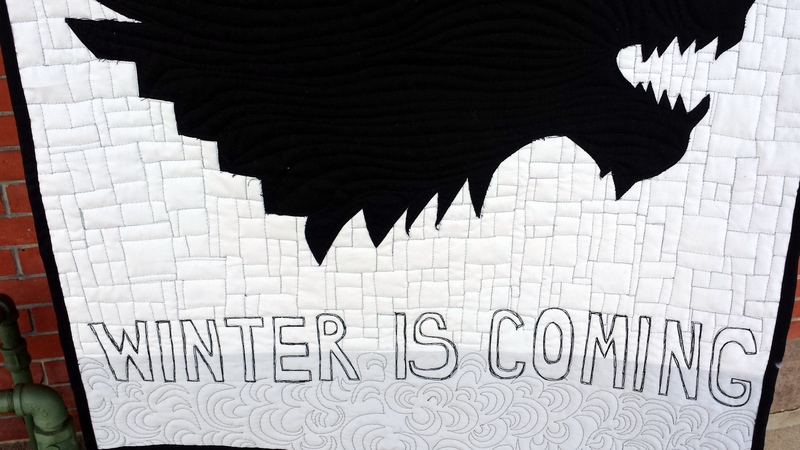 The "Winter Is Coming" quilt has been gifted, so I can share! It hung on my design wall for a couple of weeks and shocked me every time I turned around (that wolf's head is no joke - it's larger than it looks!). This quilt was made for my brother Sean's birthday upon his request. What really made this project fun is that I also appreciate Game of Thrones, its complex storyline, and actors (not so much the unending violence, though). 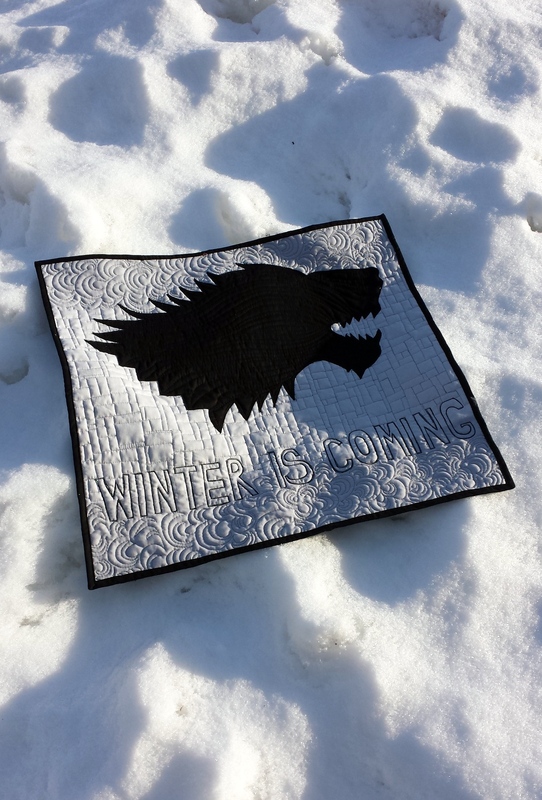 Sean asked for the Stark family sigil (the direwolf) and the popular show/book catchphrase, "Winter is Coming." The appliqued head came out better than I hoped. I cut it out of black fabric with my rotary cutter, loosely following the outline of a wolf's head I found on Google (though I'm having trouble finding the link now, sorry). I didn't print it out and trace because I enjoy the challenge of cutting and drawing things to scale. My first attempt didn't turn out great but the second was this! I didn't use interfacing to give the head more stability or for bonding - mostly because I made it during the blizzard of 2016 and I couldn't go anywhere! I glued the wolf's head down and just raw-edge appliqued around it. The fraying fabric makes it look a bit rough and furry, so that works. I thought about quilting in the details of the wolf (eyes, fur, etc.) but the black shadow on gray looked so awesomely ominous. I went with an echoing curve instead, which you can see below. From the back: a bit linty (that's black fabric for you) but cool quilting effect! In a recent WIP Wednesday post, I used two new-to-me quilting motifs: sketch letter quilting (I made up a method) and brick by brick. I'm itching to try sketch letter quilting again soon - the tutorial is here in case you'd like to try as well! I used Aurifil threads the whole way through from my "basics" collection, which gets a ton of use around here. 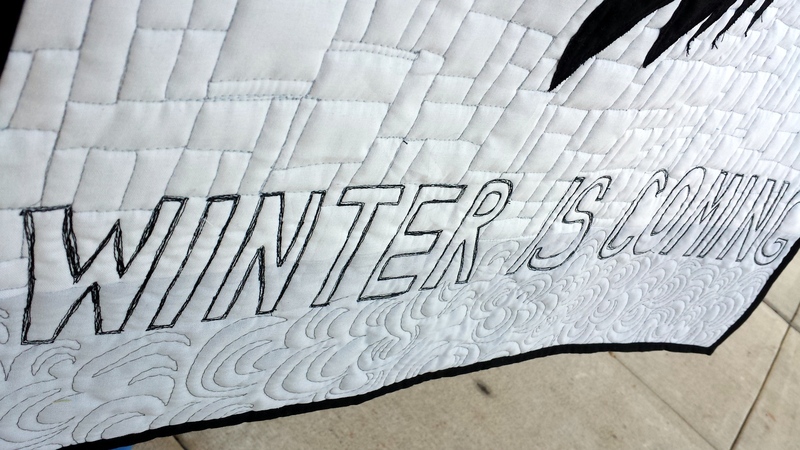 For the background, I purposefully pieced together two different shades of gray to give the quilt some depth. Using my Hera marker, I centered the letters on the intersection of the bottom two grays. I created the letters myself with free motion. 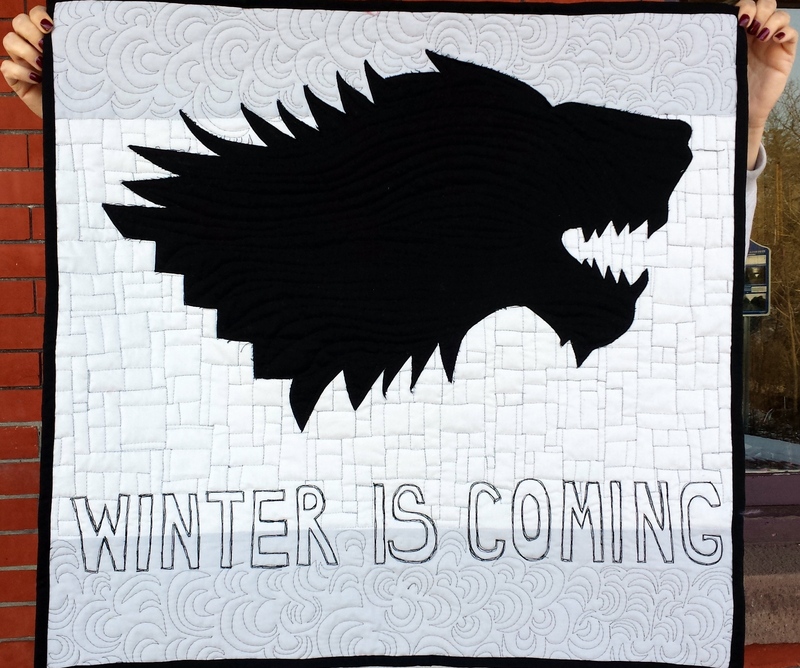 Finally, I quilted the dark gray with my own version of the "bear claw" motif by Christina Cameli for extra fierceness. Rar. Overall, I was thoroughly pleased with how this quilt came out. My brother was thrilled and he'll be hanging it up in his bachelor pad just about now! Update: it's officially hung up! I love seeing quilts in their homes. P.S. I'll be back to blogging a couple more times this week! Yay! I missed it (I only took a week's break... sheesh... but really, I love to write). Wow, fantastic! I haven't watched or read GoT but this is stunning nonetheless. I love the FMQ motifs together. The bear claw is a perfect choice and I love how it contasts with the brick quilting. Wow, really fierce and it looks great! Marvelous! Yep, Winter is coming! 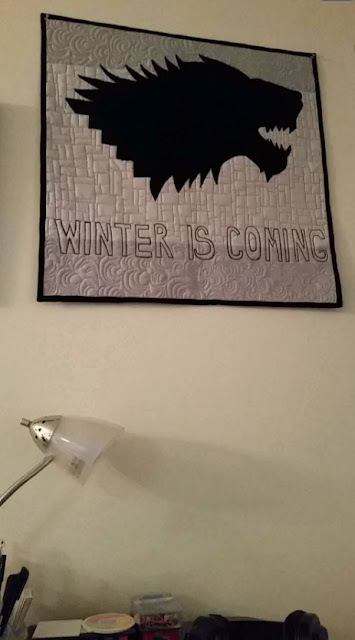 What a great gift, I am a big fan of GOT. Your did a FAB job with the wolf head. TFS. Thoroughly awesome! Another fantastic finish for you! Great finish! I love all of the different quilting designs you used on the quilt. Great job! The back side looks so cool too! Looks amazing! I'm super impressed with the fact that you rotary cut the head! It turned out awesome! 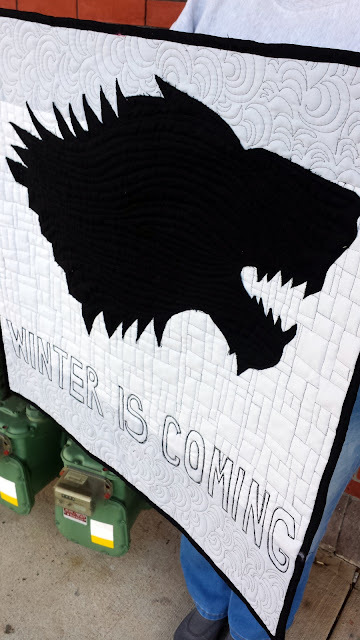 I love the quilting on the wolf, what a perfect motif to give moving-fur texture. 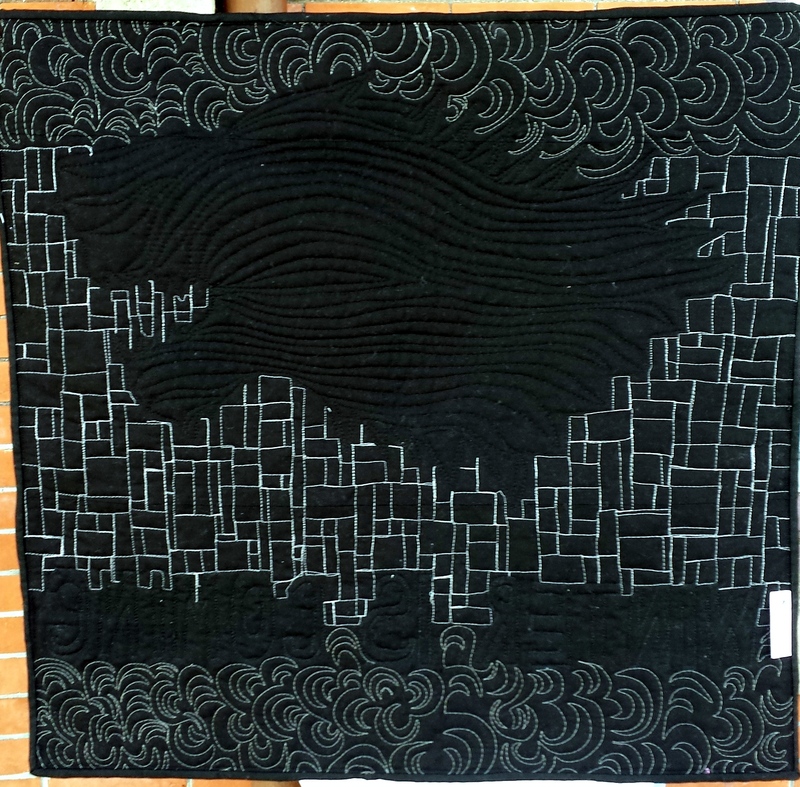 Great job on the silhouette!I love seeing personal quilts like this, with rather 'unquilty' patterns.